Travel back in time 2,000 years and enter Londinium, a Roman city which stood where the capital does today. Bring the Roman empire to life without leaving the UK (and for free!) with a walk round Roman London, from Londinium's amphitheatre to the remains of the Roman Wall. Francesca Fenn of Step Outside Guides offers a few ideas for a Roman discovery day for KS1 and KS2 children. Are you ready to travel back to Roman times? Why not spend a day in London finding out about the people who lived here nearly 2,000 years ago? More and more is being discovered about Roman London (Londinium) as huge new buildings and the Crossrail project dig deep into London’s soil and London’s past. Whole streets have been unearthed, and many everyday and precious objects have been recovered. All venues are free of charge but a bus map will be useful to travel between locations. Follow a self-guided Roads to Rome walk or download and print the Museum of London's Roman London walking trail and map to plan your route. Start your time-travelling at the Museum of London (nearest Tube stations St Paul's, Barbican, Moorgate). There is a whole area devoted to life in Roman London; some of the many Roman articles which have been excavated in London are displayed here. There are pots, glass and lots of everyday articles – and leather bikinis, too! We get a wonderful glimpse of life in Londinium, and the museum also has lots of information about locations where Roman London is exposed. Did you know Londinium had an amphitheatre where gladiators and wild animals fought, and executions took place? It was rediscovered in 1988 near the Museum of London, in Guildhall. Once there, you can go underground to see the amphitheatre, and imagine the roar of the crowds as competitors clashed. The area of the original amphitheatre is marked in stone in Guildhall Courtyard. The Roman temple of Mithras was built in the third century AD, in the heart of what is now the City of London. Discovered in 1954 and considered to be one of the UK's most significant archaelogical sites, the reconstructed Temple can now be admired in a purpose-built Bloomberg SPACE. Entry is free, there are some fantastic (free) kids' resources to use, both on paper and tablet-based, and the light and sound installation in the temple is very atmospheric and a great way to step into the past. The British Museum (nearest Tube station Holborn) is the place to go if you want to see a real gladiator’s helmet. The biggest and best stretch of Roman wall is just beside the Tower of London. It is several metres high, and then has medieval wall built on top, making it even higher! You can walk through a doorway in the wall, and imagine you are a Roman citizen. 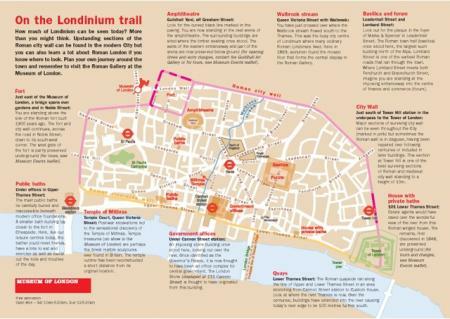 You can also follow the London Wall Walk and see all the remains of the Roman walls of Londinium; download and print explanation sheets before you set off to help transport you back to a time of togas, villas and gladiators. We hope you enjoy your day in Londinium, and now know and understand a little more about life in Roman London. Bring KS1 and KS2 history to life with a day out in London: we recommend great Tudor, Great Fire of London and Victorian locations to visit with primary school children. Step Outside Guides are £5 each and are written to enable families and groups to enjoy cost-free days discovering London. 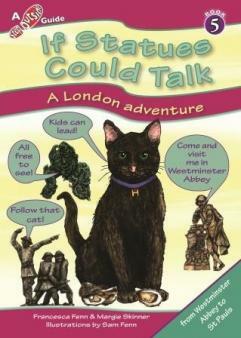 Book 5, ‘If Statues Could Talk….’ offers free entrance to Westminster Abbey for families with primary-aged children who visit the Abbey with their guide. Visit www.stepoutsideguides.com to order online and to learn more about the Guides.